Toddler Approved! 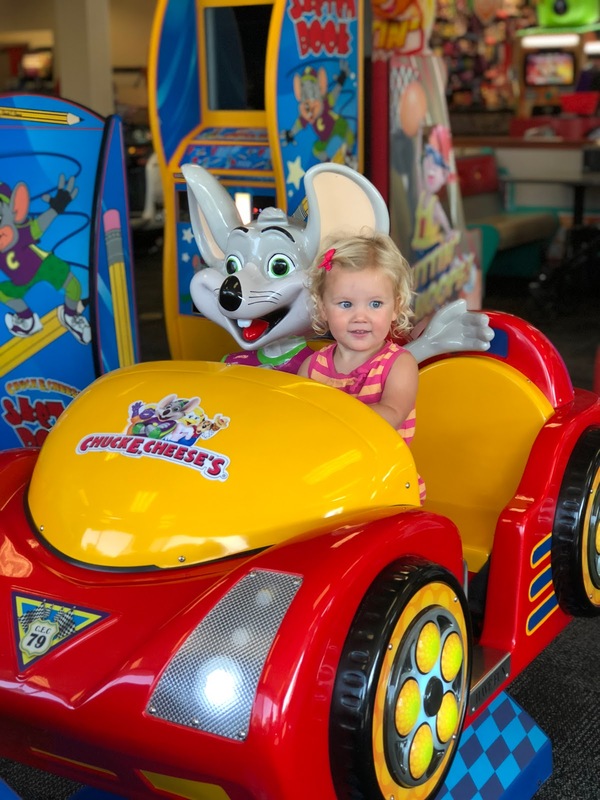 : 3 Reasons Chuck E. Cheese's is a Great Spot for a Toddler Mom Break! 3 Reasons Chuck E. Cheese's is a Great Spot for a Toddler Mom Break! If you read our blog often, then you know that we love sharing helpful resources for families. This year we've partnered with Chuck E. Cheese's for some sponsored posts and have enjoyed showing you all of the fun we've had! Everyone needs a break from the usual schedule! This Fall is proving to be our busiest yet with three of my four kids in school and sports and other activities. I spend most of my day in the car! My poor toddler gets tired of getting dragged in and out of the car to do pick ups and drop offs and just hang out. Last week I was wiped out and needed an afternoon off... so we cleared our schedule. With the fires in our area (we're in Northern California), the air quality was terrible and we couldn't really be outside. The kids had the brilliant idea to head to Chuck E. Cheese's and it ended up being the perfect "mom break" for me. I put away my phone and just had fun following the kids around and watching them enjoy time together. It was so nice to "check out" from reality and just have a good time! 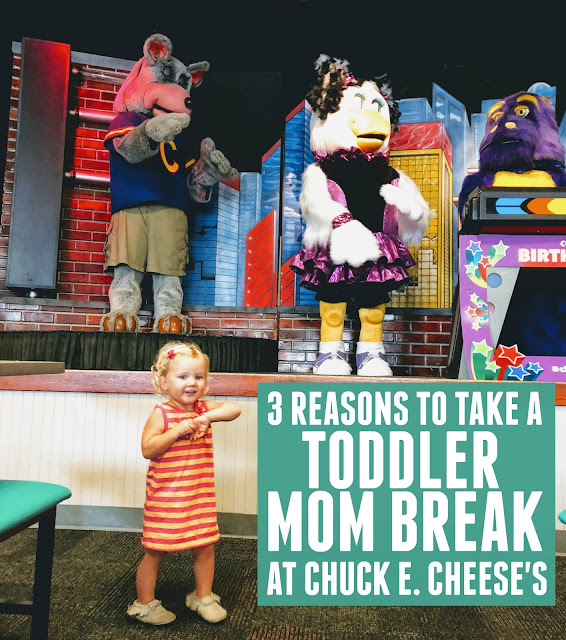 There are three reasons why I think Chuck E. Cheese's can be the perfect "mom break" (parent break) for busy families! You can also see why we love it for birthday parties here and for helping new siblings adjust here. 1. 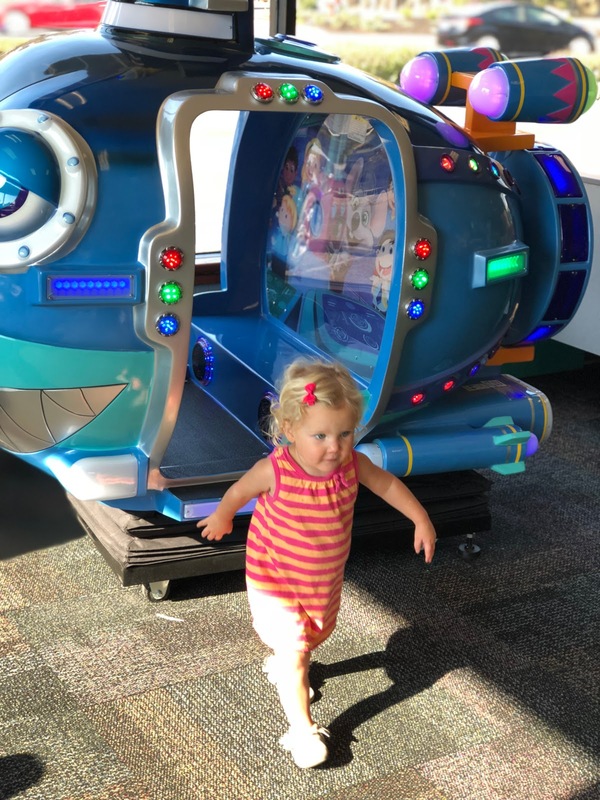 Toddlers can get out some energy in a contained location! With toddlers I love any places that are fenced in or have a contained location for playing. Huge parks with lakes or streams stress me out since my kids are usually the ones trying to jump in or running far away. They love to use all the space that they are offered. When I need a break, heading somewhere with walls or that is gated off helps me relax a tiny little bit. 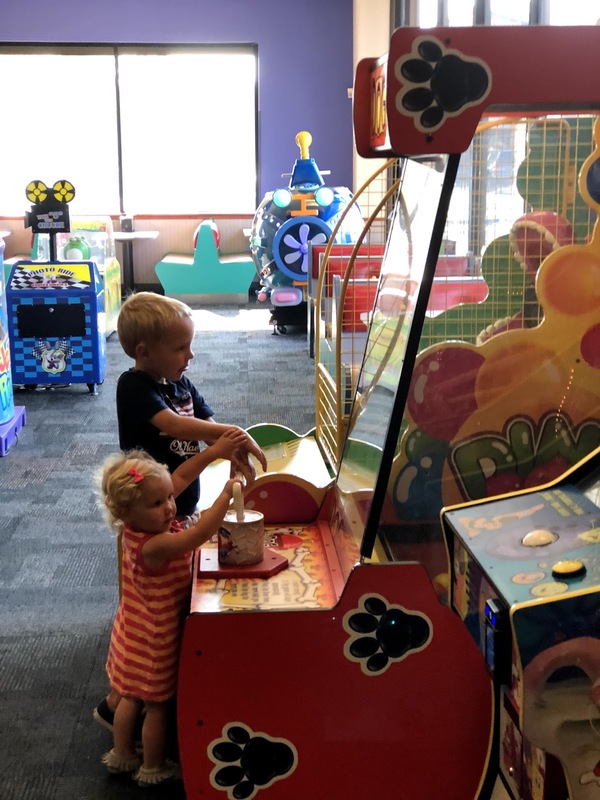 You can never fully relax with the toddler... but our trip to Chuck E. Cheese's last week was pretty close to a full mom break. I can wander around with my toddler while chatting with friends. I took a video of my toddler for a few minutes while we were playing and I was actually wishing I had a tracker on her to see how much walking/running she managed to squeeze in during our trip. Not only did I get a break, but she got a lot of energy out running from ride to ride to game to game just watching my big kids play. She (and her big siblings) went home exhausted! 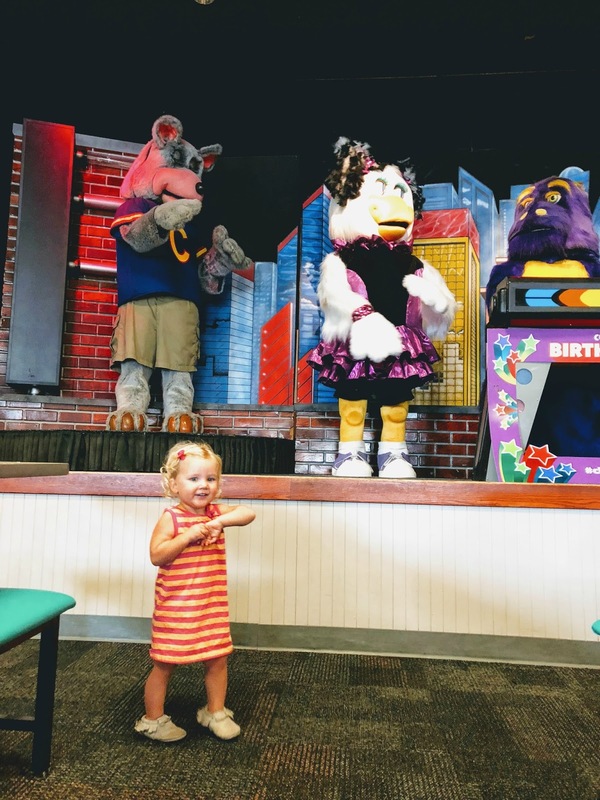 She also loved dancing with Chuck E and friends. 2. There are a variety of food options- for adults and kids! parent-friendly menu items – including gluten-free and thin and crispy pizza crust. They continue to offer new menu items all the time... including two of our favorites, Cali Alfredo and BBQ Chicken pizza! 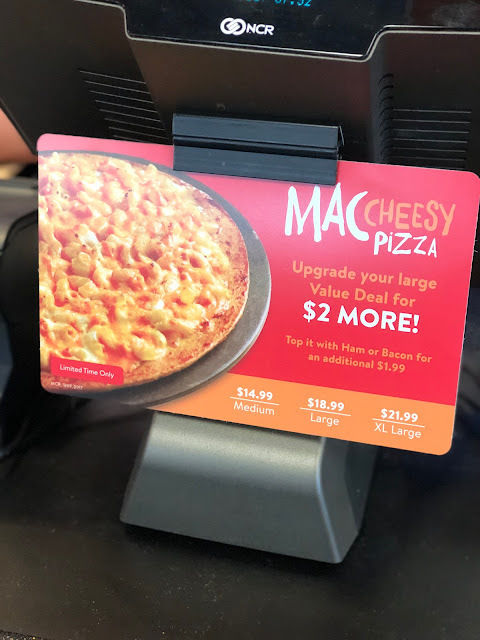 Last week we tried out one of the special Limited Time Offer pizzas- the Mac Cheesy Pizza - featuring creamy cheese sauce and elbow macaroni—all smothered in melted, bubbly Colby and mozzarella cheese. My kids are huge mac n cheese fans, so we had a mac cheesy pizza taste test! My toddler and my 6-year-old were the biggest fans. They love noodles! Families can even enjoy their favorite handmade pizzas, fresh salads and delicious cinnamon dessert pizza at the All-You- Can-Eat Buffet, available Monday through Friday from 11 a.m. - 2p.m. at participating locations. Did you know that in a recent nationwide blind taste test, more than 60 percent of people expressing a preference chose Chuck E. Cheese's Thin and Crispy pepperoni pizza over Pizza Hut's ® Thin and Crispy pepperoni pizza? I love that there is pizza if we are starving at 3:30pm after a busy school day and there are appetizers like pretzel bites or wings or even wraps and ciabatta sandwiches if we want something a bit lighter! There is something for everyone. 3. The games and shows provide easy entertainment! By late afternoon I am usually ready to curl up for a nap... but that rarely can happen. Often my energy is zapped and I don't feel like coming up with ideas of things for the kids to do... or cleaning up the messes from the ideas they DO come up with. An afternoon off where Chuck E. Cheese's provides the entertainment, does the clean up. and offers a snack or early dinner is just what I need on crazy busy weeks! 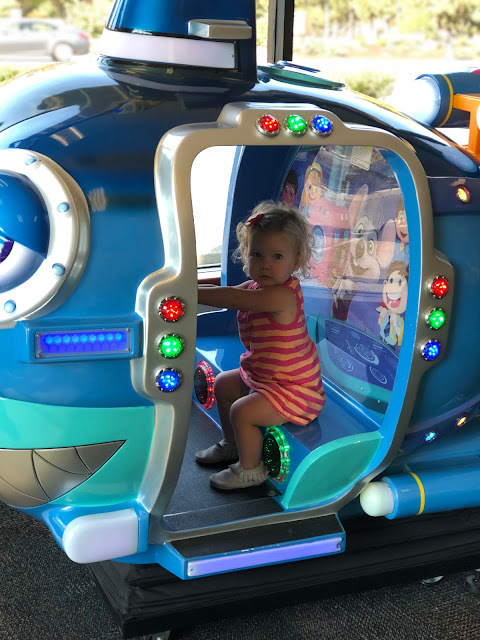 The buttons on the games are fun for toddlers to push and my toddler also just likes to get on and off the rides. She has no idea yet that they move or do anything... so we're trying to keep her in the dark about that for now! I think she climbed on and off this rocket ship 15- 20 times. The Chuck E. Cheese's characters dance and sing too and my toddler could've stood there watching them forever. Eventually we did have to go home though! I will definitely be heading back to Chuck E. Cheese's for a mom break again soon. I highly recommend it! 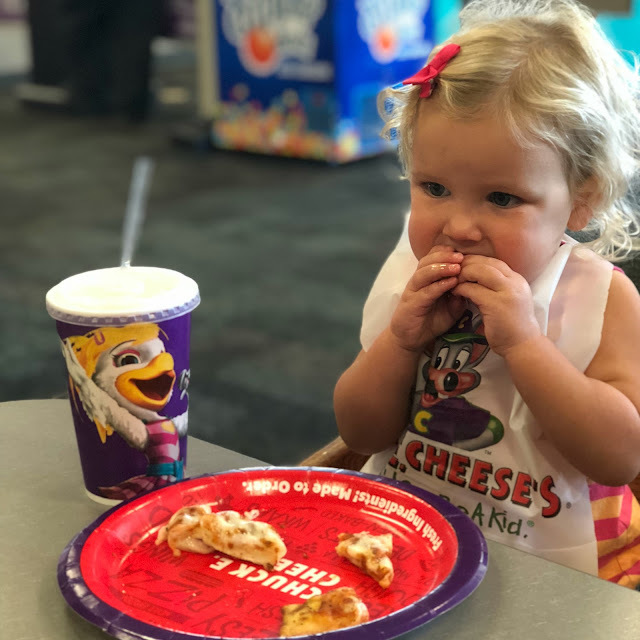 Find more details on promotions, limited time offers, and other awesome menu items by visiting Chuck E Cheese’s online, on Facebook, Twitter or Instagram.